Before your turtle lays eggs, you must decide how you will incubate them. 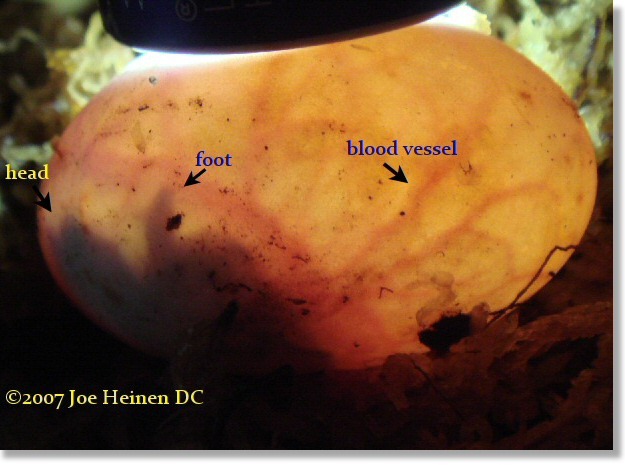 In most cases, if the eggs are laid in a nest....natural incubation is best. If you chose the natural route, its best to build a "cage" of hardware cloth around the site to protect the eggs form predators and to make it easy to find the newly hatched turtles. Be sure to anchor the cage with stakes. 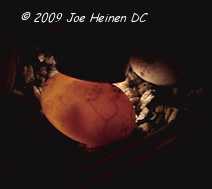 For many, the next best choice is incubating the eggs artificially. In my area the fire ants would destroy the eggs in a few days. So...I choose the incubator method. 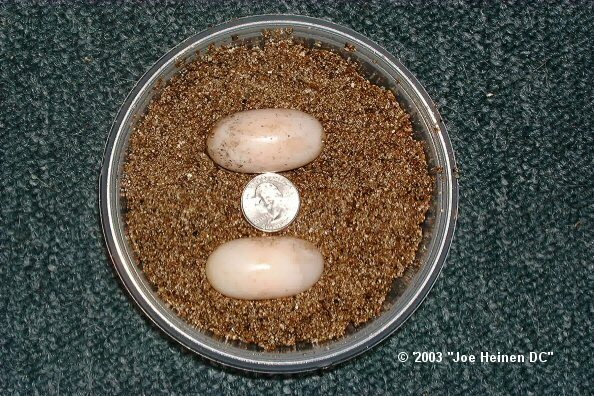 I like to have an incubator set up prior to egg laying. I use the Hovabator. Its fairly cheap and keeps a constant temperature. An accurate digital max/min thermometer is a must. It can take a few days to get the temperature right. Most recommend the temperature to be set between 25°C (77°F) and 28°C (82°F). There is some evidence that the lower temps produce more males and higher temps.. .more females. If the temps are too high shell deformities (such as extra scutes) will occur. 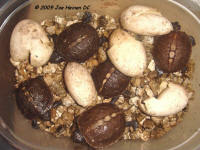 In the past I have set the temperature to 26.7°C (80°F) and got a mix of males and females without deformities. Before digging up the eggs, set up a disposable storage container big enough to hold the eggs (you can see some examples below). Fill it half way with moist vermiculite (available at garden centers). To moisten the vermiculite , soak it then squeeze out any excess water. Drill many holes in the lid. I also use sphagnum moss, composted hay and dirt from the nest. The most critical issue is maintaining high humidity. If the eggs dry out they will start to collapse. Once the eggs are laid, carefully dig them up being sure not to rotate or flip them. I use a soft lead pencil to mark the date and weight on the top of the egg. Bury it half way in the vermiculite and cover with a damp piece of paper towel or some strands of damp sphagnum moss. Put the lid on loosely. In the incubator I put a few open containers of water. This helps keep the temps stable and helps with humidity. If all goes well they should hatch in 60-90 days. In This short video clip, you can see the embryo move.